More items in le vault. Merry Christmas! Hope all is well wherever you are. Wanted to share some things I’ve been virtually “collecting” this month. I play guitar and lose guitar picks all the time. This is a nice solution for keeping them on you at all times. It would be nice too if the pick holder could carry more than one – you never know. I just bought finger gloves after being frustrated with the limited number of things I could do with regular gloves. However, my finger gloves leave the thumb covered, which doesn’t actually make things easier (especially when trying to scroll on an ipod classic). These gloves seemed to have figured out a good balance between the fingers that you need and the amount of warmth your hands could use in the cold. Etre has both Touchy Gloves that leaves the thumb and index fingers uncovered as well as the Fivepoint, which works with touchscreen. This is for the music and/or infographic geeks. 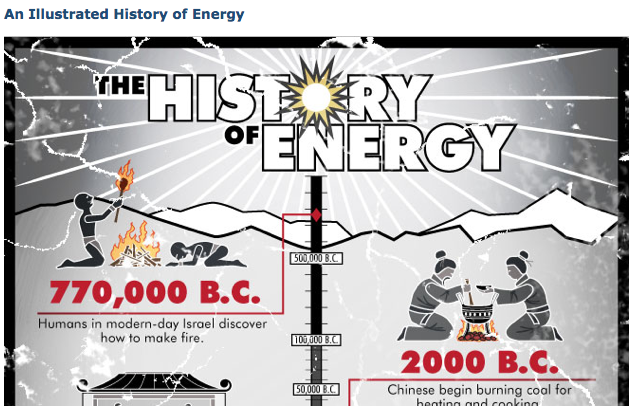 Although most people learn some form of the “energy history” at school, this graphic makes it easy to appreciate how quickly our technology in this field has grown in such a short time span. This is definitely a serious topic. I was ambivalent about taking the quiz to “calculate my slavery footprint,” because it’s a hard thing to think about. You know it exists, but you don’t want to believe that you are any part of the system. The truth is that slavery still occurs in many places and in many forms around the globe, and it’s our responsibility to educate ourselves about it. Forced labor happens, and it is something we need to think about as we consume a lot of the products we do every day. Take the quiz and see for yourself.